Our thriving student population and expanding academic programs require us to set long-term plans for the physical growth and evolution of our main campus in Aurora. Our current master plan outlines future expansion areas, envisions new buildings and addresses parking needs. The initial version of the current master plan was approved by the City of Aurora in 2004. Four years later, the university began to refine the plan to better identify future expansion areas and buildings. After public hearings and conversations, the City approved a revised master plan in 2009, and then approved further revisions to the plan in early 2012. In July 2014, the most current version was approved, which refines earlier iterations. The Hill Welcome Center will provide distinguished gathering spaces for campus and community functions. Within the center is the Ethel Tapper Recital Hall, offering intimate performance space for up to 80 guests, and the Schingoethe Museum which celebrates Native American culture. The museum’s art gallery will showcase professional and student artists during several exhibitions throughout the year. The 20,000 square-foot building is the latest addition to the AU campus and it will be dedicated later in 2015. Aurora University reported the following enrollment figures to the National Center for Education Statistics with its submission of IPEDS reports (Integrated Post-Secondary Education Data System) as required by the U.S. Department of Education. The full-time equivalency (FTE) figures act as the basis for on-campus parking requirements as determined by a City of Aurora formula outlined in the master plan. 2014 Master Plan (click image to enlarge). In July 2014, the City of Aurora approved the current version of the Master Plan. Notably, this plan reflects the final design of the John C. Dunham STEM Partnership School, the Hill Welcome Center and the expanded parking in Lots E and J as of fall 2014. The university is entering collaborative conversations with City of Aurora officials to further refine the master plan. 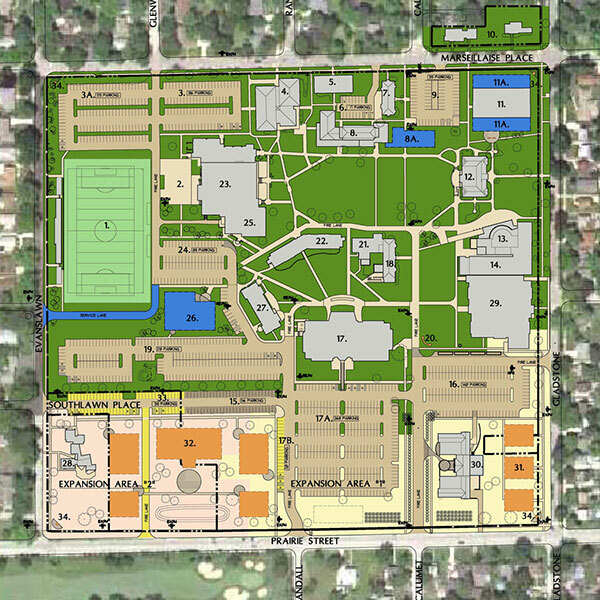 For questions or comments on the Aurora University Master Plan, email masterplan@aurora.edu.